Inkfish: How Many Continents Does Katy Perry's "Roar" Video Take Place On Simultaneously? 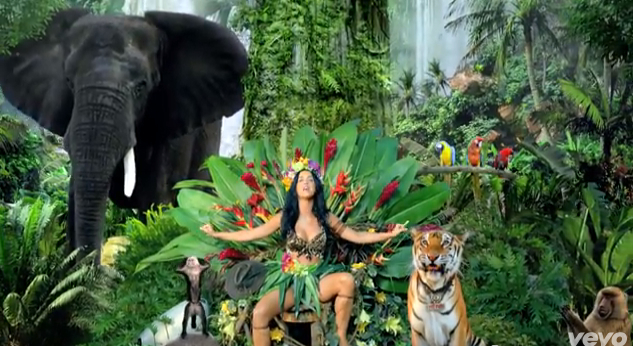 How Many Continents Does Katy Perry's "Roar" Video Take Place On Simultaneously? 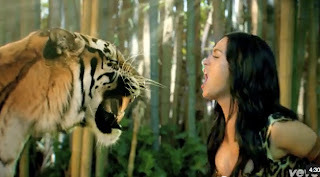 The video for Katy Perry's newest single, "Roar," has been viewed almost 36 million times since it appeared online four days ago. In case none of those views were yours, a quick plot summary: A woman crash-lands in the jungle with an attractive but inconsiderate boyfriend in safari gear who's eaten by a tiger at 0:40. She's scared at first, but soon befriends a monkey, is bathed by a helpful elephant, and changes out of her old clothes into (spoiler alert!) a leopard bra. And sings. On her road to empowerment, Katy gets help from a diverse array of animals. So diverse, in fact, that their being together in the jungle might be the most fantastical element of the video. 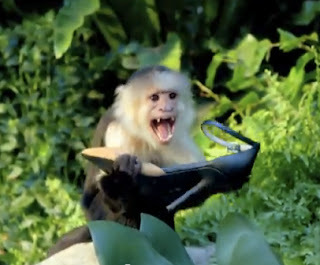 First there's the monkey, seen above inspiring Katy to turn her stiletto* into a spear. It's a capuchin, native to Central and South America. What about the beast that disposed of the boyfriend? Katy sings "I've got the eye of the tiger," and she's got the whole body of it in her video. But tigers live only in Asia, so either the big cat or the monkey seems to have taken a wrong turn across an ocean somewhere. Elephants can live in Asia as well, so maybe Katy's pachyderm friend (who does double duty as shower head and clothes hook) is in the right place. Asian elephants, though, have distinctively small ears that sit low on their heads. The fellows with the big flapping ears—on full display in the picture at the bottom of this page—are African elephants. So now we're up to three landmasses at once. 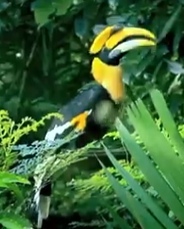 Perhaps this bird can settle the tie: it looks like a great hornbill, a tropical bird from Asia. A crocodile would have given another point to Africa. Sorry, cradle of civilization! But wait—sneaking into the frame during the final seconds of the video is a baboon, a monkey that lives only in Africa (except for a desert-dwelling species in the southern tip of the Arabian Peninsula). And key to the plot of the whole video is this red bird. Katy uses its feathers to build a lure that tempts the tiger, which she ultimately subdues in a roar-off and turns into her pet. The red bird also provides a plot twist for our purposes. I sent the picture to ornithologist and Guardian blogger GrrlScientist for identification. "Oh wow," she wrote back, "a female eclectus parrot." The males are bright green with orange beaks, looking like a different species altogether. Eclectus parrots don't live alongside the capuchin, the elephant, or the tiger: they're native to northeastern Australia, New Guinea, and neighboring islands. At least four parts of the world, then, are represented in Katy's jungle. (Don't worry about the leopard bra—our heroine fashioned it out of a scarf she was wearing on the plane.) It's a little surprising not to see a lion in the video, since it's the only animal aside from the tiger that actually appears in the song's lyrics. But then again, lions prefer the savanna to the forest. Maybe that would have been too unrealistic. *I'm not sure of the species of shoe. 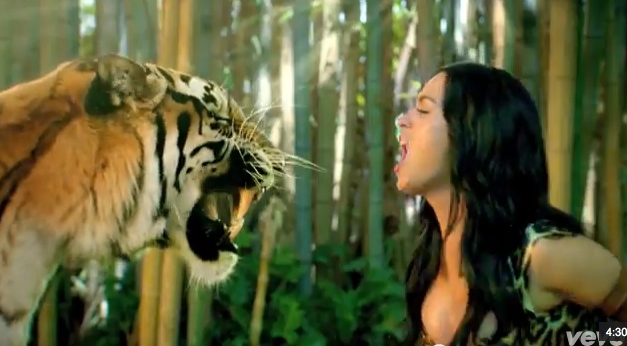 Images: screenshots from "Katy Perry - Roar."